Figuring out when your peanuts are ready is a lot like deciding when to harvest sweet potatoes. First, check the days to harvest. We grow one of the few varieties with a short enough season to mature in zone 6 (Early Spanish --- 100 days to harvest), which means that we could potentially dig our peanuts anytime after the first of September. Various websites admonish you to wait until the leaves on your peanuts are starting to yellow, but it's now nearly a month after our peanuts are supposed to be ripe, and we haven't seen any yellowing. However, the plants did mostly stop blooming a couple of weeks ago, which I suspect is a good sign that they're nearing maturity. If you think the date is close enough, dig up a test plant. 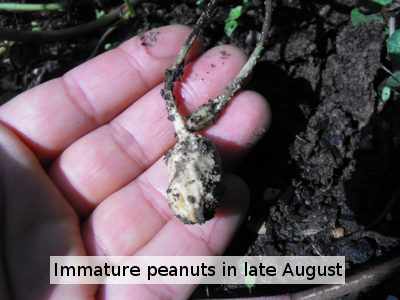 To dig peanuts, sink your shovel straight down into the soil about six inches away from the plant's stalk and lever the pointed end toward the plant, loosening the soil underneath. Then gently lift the plant out of the soil. If the ground is clayey and too wet or too dry, you'll lose peanuts in the process, so it's best to make sure your soil is moderately damp before digging a test plant. Dig your whole patch just like you dug the test plant, then put them on a screen or in another airy location to dry. Don't eat any of your bounty yet (including that test peanut!) 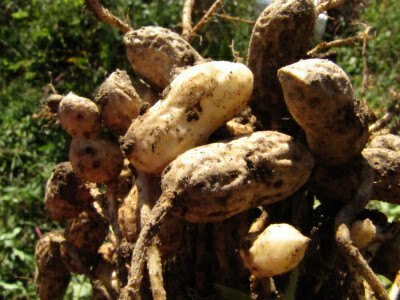 Fresh peanuts contain a mild toxin and need to cure for a few days before they can be eaten. Once you've waited the requisite time, check out my post about making your own peanut butter! 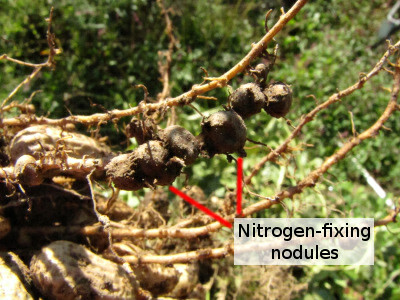 there are seed pods like small skinny pea pods on the upper part of the peanut plant. what are these used for? are they seeds and can i plant them and get a peanut crop next year?